Clocks are a potent literary symbol: in Peter Pan, the tick-tocking alligator represents getting devoured by time, while the chiming ebony clock in Edgar Allan Poe's The Masque of the Red Death signifies mortality. And then there's The House With a Clock In Its Walls, where a chiming clock is — bear with me here — an object of obsession for a steampunk warlock living in a kooky enchanted mansion. 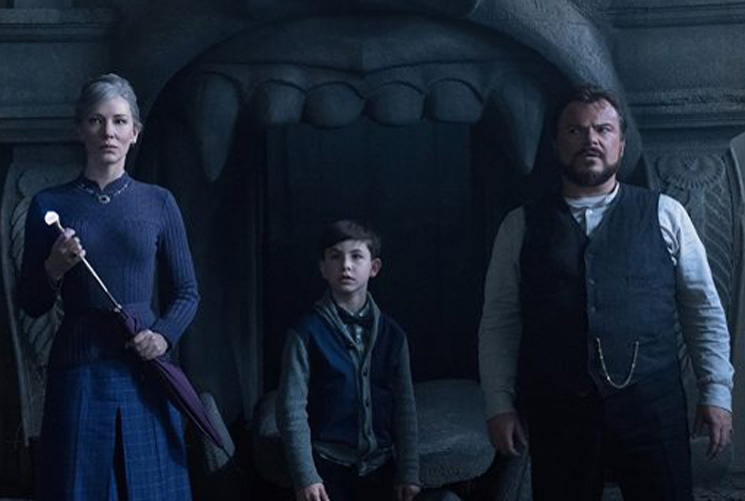 It's 1955, and 10 year old Lewis Barnavelt (Owen Vaccaro) has been sent to live with his uncle Jonathan (Jack Black) after his parents die in a car crash. Making matters even worse, Jonathan turns out to be the kind of guy who wears a kimono and a fez, and he has a sculpted beard that looks like it was stolen off of Dave Navarro's face. He's a "fun uncle" who feeds Lewis nothing but cookies and lets him win at poker while gambling with purple-clad neighbour Florence Zimmerman (Cate Blanchett). Jonathan also has secrets. It becomes apparent that he and Florence are magicians, and the house is full of supernatural surprises like a sentient armchair and stained glass windows with moving images. The house's previous owner, Isaac Izard (Kyle MacLachlan), hid a sinister clock within the house, and the inhabitants must find it before it ticks down to zero. The plot unravels like a mystery, but the constant kid-friendly zaniness means that it's more inane than gripping. The comedic elements suffer much the same fate, as wackiness is used in place of actual jokes, like when Jonathan prances around the yard wailing on a saxophone for some reason. Lewis's grief at his parents' recent death isn't in the slightest bit believable, and his main personality trait is that he's a real know-it-all about the meaning of words. There's also a strong suggestion that Florence's family died in the Holocaust — a wildly out-of-place attempt at seriousness that totally misses the mark in this goofball kids movie. Given that Eli Roth is best known as a horror director, it makes sense that the film's strongest element is its spookiness. With a shadowy haunted house, creepy dolls and sinister jack-o'-lanterns, this movie will likely seriously scare some children. Even adults may get a little tense at the arrival of the villain Isaac's wife Selena (Renée Elise Goldsberry). The trouble is, it all feels a bit heartless. The school scenes, when the odd and brainy Lewis is shunned by his peers, are the only time when the film pulls at the heartstrings. (Never mind the fact that this vision of 1950s America seriously revises history in regards to classroom integration.) For a film with an all-star cast that aims to be funny, tragic and mysterious, it's a bit of a bore.